As system administrator, you can create additional user accounts for your family and your friends. Each user account gets its own HOME directory for private files and has access to the PUBLIC directory to share files among the different users. Username The name of the user account. All 26 English letters in lower case (a-z), numbers(0-9), dash(-) and underscore(_) can be used. The username cannot begin with a number. The maximum length of the username is 32 digits. Password The password of the user account. Any letters or symbols on the keyboard can be used. Confirm Enter the same password a second time to confirm it. 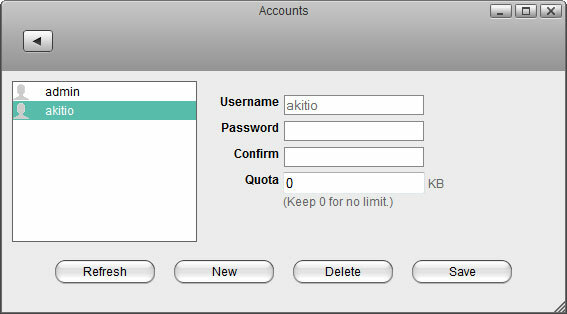 Quota Enter a value in kb to set a limit for the storage space that can be used or leave it at 0 for unlimited storage. Note: This option is only available for the MyCloud Pro. New Create a new user account. Delete Delete the selected user account. Save Save the new user account and confirm the changes. Each user account gets its own HOME directory for private files and has access to the PUBLIC directory to share files among the different users. Only the administrator has access to the system preferences. The normal user accounts can only see their own private HOME directory and the shared PUBLIC directory. The normal user accounts have no access to any other data, including the attached USB drives. Select the user that you want to delete from the user list. The administrator account (admin) cannot be deleted. Select the user that you want to edit from the user list. Click Save to update the password.